Today I decided to do a solo episode because it’s been a long time since I’ve taken the mic to give some of my own opinions. 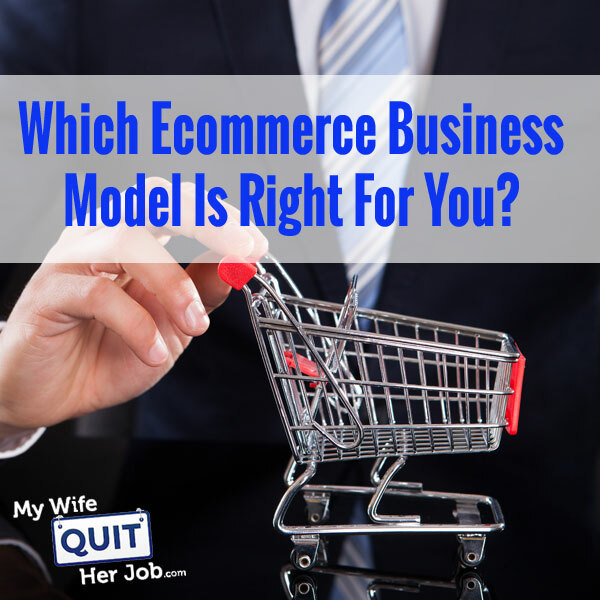 A lot of people have been asking for advice lately on what type of ecommerce business model to pursue so I put together a quick and dirty episode to describe all the different models out there and give you enough information for you to make an educated decision for yourself. Bench.co – If you hate bookkeeping and accounting as much as I do, then why not use a service and contract everything out? Not only is Bench Accounting easy and affordable but you can click here and get 20% off your first 6 months of worry free bookkeeping. SiteLock.com – Most people tend to neglect security when they first launch their websites. And it’s all fun and games until you get hacked. In the event that this ever happens to you, SiteLock can help you restore your site and lock it down tight. Click here and get your first 3 months free. Steve: You are listening to the My Wife Quit her Job Podcast. If you are new here, it’s a show where I bring in successful bootstrapped business owners to teach us what strategies are working and what strategies are not. Now I don’t bring on these famous entrepreneurs to simply celebrate their success, instead I have them take us back to the beginning, and delve deeply into the exact strategies they used early on to gain traction for their businesses. Now if you enjoy this podcast please leave me a review on iTunes, and if you want to learn how to start your own online business be sure to sign up for my free 6-day mini course, where I show you how my wife and I managed to make over 100K in profit in our first year of business. Go to mywifequitherjob.com, sign up right there on the front page, and I’ll send you the mini course right away via email. Now before we begin, I also want to give a shout out to sitelock.com for being a sponsor of the show. SiteLock is the leader in website security, and protects over 8 million websites by monitoring them from malicious activities 24 hours a day, 7 days a week. So here is the thing, most online business owners never think about security until they get hacked, and a long time ago my online store actually got hacked, and it was the most miserable experience ever. I basically lost thousands of dollars as I frantically tried to patch the issues on my site, and get my store back online as quickly as possible. In the event that you get hacked, you can call sitelock.com, and they will help you out, or even better protect your site before you even get hacked. For more information, go to sitelock.com/mywifequitherjob. Once again that’s sitelock.com/mywifequitherjob. Now on to the show. Intro: Welcome to the My Wife Quite Her Job Podcast. We will teach you how to create a business that suits your lifestyle, so you can spend more time with your family, and focus on doing the things that you love. Here is your host, Steve Chou. Steve: Welcome to the My Wife Quit Her Job podcast. Today I thought I do a solo episode mainly because I’ve been getting a lot of questions lately about what type of e-commerce business model to pursue. Every time I publish an article on entrepreneurship that encourages my readers to start their own businesses, I find myself tip-toeing across a very fine line. On one hand starting an online business, an e-commerce business is pretty simple, relatively risk free, and it doesn’t require a lot of startup capital, but on the other hand running a successful business also requires a ton of hard work, perseverance, and a little bit of luck. The problem is when I emphasize the enormous amount of work that’s involved to launch a company; I tend to turn people away from wanting to start a business. But when I emphasize simplicity, people tend to harbor unrealistic expectations and expect a quick path to riches. In fact one of the number one questions I do get asked is how long it actually takes to make good money with an e-commerce business. It’s unfortunate and this is a pattern that I’ve been seeing, but a lot of would be entrepreneurs tend to choose the business model to pursue based purely on how easy it is to start, as opposed to considering the actual probability of success. In fact just the other day I was getting emails from people asking me, why they should go through the hustle of selling physical products online when they can just be an affiliate. Why should they start their own inventory when they can simply drop ship all their goods, and why should they even bother setting up a shopping cart when they can just put up a blog, and sell advertizing? What makes things even more confusing is that these people, they are on Facebook, and they are looking at their feeds, and every time they go on Facebook they see a brand new business guru pushing yet another e-commerce business model. While a lot of these methods are legit, just the sheer number of choices is pretty overwhelming even to me, like I had to go through, and watch some of these webinars to just get an idea of what some of these gurus were pushing. Now I don’t really consider myself a guru, but I do get quite a few emails from readers asking for advice on what type of business model to begin. What I thought I do today is go over all the different e-commerce business models that I’ve seen online, and give some commentary on them, and discuss the pros and cons, and let you decide for yourself. Whatever you do you should never pursue a business model simply because of how easy it is to start. Instead you got to make sure you consider other factors like the long term sustainably of the business as well as the probability of success. Now keep in mind that when you are listening to the business models that I am about to describe, some of these business models are really easy, they have very low barriers to entry, low cost, and lower overhead. Some of these business models are easy to start, but they are super competitive. Some of these business models require a decent upfront investment to start. Some of them require inventory, some of them require that you put up your own website. So I’m going to discuss the pros and cons of all these business models based on the following criteria, how easy it is to get started, how quickly you can make money, and the defensibility of your business and its long term potential to create sustainable income, and basically how hard it is to make money, and how easy it is for some of them to just go ahead, and all of a sudden launch a competitor to your business. If you have been reading my blog for a long time, I have this strong belief that the more work and the more effort that you put into your business to be successful, the more sustainable your business will be in the long run, because it will be that much harder for someone to copy you. So that being said one of the most popular business models that I get asked about is drop shipping. Now if you guys aren’t familiar with drop shipping, drop shipping is basically when you put up a website to take orders, but you don’t have to carry any inventory. Instead of fulfilling the products yourself, what happens is when you get an order, you don’t fulfill yourself, you send it over to your vendor, and then the vendor is responsible for shipping the order to the end customer. One of the huge advantages of this business model is that you don’t have to carry any inventory; you don’t have to do any order fulfillment. It’s really cheap to start up a drop ship business, because all you need is a website essentially, and infact as part of my 6 day mini course I show you how to set up aside an open cart for 5 bucks a month, and you can easily do drop shipping with just a very simple open cart shopping cart. It is really simple to start basically, all you need to do is find a vendor who is willing to drop ship for you, and all of a sudden you have a whole bunch of products that you can list on your site. In order to get one of these vendors to approve you, you have to show them that you are legit. Often times you might have to put up your website, and a good looking website, and populate it with mock products before you can even get approved as a retailer, but once you do get approved, you will have access to that vendor’s entire portfolio which you can list in your shop. What’s nice about the drop shipping with your own website model also is that you are in full control of your store brand, because you own the website, but the downside of drop shipping of course is that the margins are super low. Mainly because someone else is storing all the inventory, and doing all the fulfillment for you, naturally you are going to have to pay for that. Now the profit margins for typical drop ship stores are anywhere between 10 and 30%, and most people who I have met, who have had successful drop ship stores tend to sell products that are more expensive, anywhere from $200 to $1000. Because the profit margins are slimmer, you want to sell more expensive products to make up for that fact. Now because the margins are so low, paid advertizing becomes a little bit more challenging, because you don’t have as much margin to play with, and as a result of that often times you are going to be stuck relying on search engine optimization only, and all the free traffic that Google can get for you, or you might rely on social media or Pinterest or Facebook. Some of the drop shippers that I know who have been successful, they have been able to run Google shopping campaigns successfully, but in terms of regular Adwords or Facebook ads, they have not been able to get that profitable, mainly because it requires a larger margin to get those advertizing mediums to work. Now the other thing that can be problematic as well with drop shipping is that you might be competing with other shops carrying the exact same product you are, except physically carrying inventory, and because their margins are higher they have a little bit more flexibility in what they can do with their products in terms of promotions and that sort of thing. Finally since you are selling other people’s products, you aren’t really in control of the product mix. A vendor can obsolete a product at any time, and you will have to update your website accordingly. The other downside of drop shipping is that you are not really in control of your customer support, because you are not the one fulfilling the products. And so let’s say an order comes in, and you send it over to your vendor, and the customer complains that they never got it, well guess what, you are responsible for the fulfillment even though you are not the one doing it. What ends up happening is you have to contact the vendor and act as the go between, between the customer and your vendor to make sure the product reaches the end customer. Anything that goes wrong it’s on you; it’s your store’s reputation and not your vendor’s. What’s also complicated also is maintaining inventory issues, because you don’t really want to be selling stuff when your vendor is out of stock. And so you want to make sure you work with the right vendors that have the EDI system in place, so that you can track the inventory and make sure you don’t sell something that is accidentally out of stock. But overall what makes a drop shipping a little bit more fragile in terms of business model for me, is that you’re heavily dependent on your vendors for your business reputation. A vendor can cancel the drop shipping arrangement anytime. They can discontinue products, and basically you are at their mercy. The other thing I don’t like of course is the fact that the margins are low, which greatly limits the paid advertizing options. For our store at Bumblebee Linens, we spend a lot of money on paid advertizing, because it converts very well, and our margins are really high, so that we can afford to do them. The next business model I want to talk about is drop shipping from Amazon to eBay. Now this is also known as eBay Amazon arbitrage, and here is how it works. First you find products at Amazon that are selling higher on eBay, and then you take the images and the product copy from the Amazon product, and you post an identical listing on eBay that is significantly higher in cost. There is a bunch of courses and software out there that will do this for you pretty automatically, and the reason this business model works is because people who shop on eBay tend not to shop on Amazon, and for some reason there is a lot of people on eBay who are not aware that eBay is not the cheapest place to be shopping. As soon as the auction closes on eBay the seller then purchases the exact same product on Amazon, and has it shipped over to the eBay customer. And so basically you are just leveraging the difference in prices from Amazon and eBay. What ends up being problematic to the brand owner is that the product gets shipped in an Amazon box. Let’s say you are an eBay customer and you get shipped a product in an Amazon box, you are going to be thinking to yourself, what’s going on here, and you might actually go and check up on Amazon for that exact same product, and then discover that you got ripped off. Usually what happens is that that customer will complain to the brand directly, which usually results in a return, and so just this practice tends to piss off brand owners. I know a couple of brand owners who have complained and have gotten some of these eBay sellers banned, so this is a pretty dangerous business model. Personally I actually hate people that do this, but it is attractive if you want a business that has no over head costs, there is no website required, you don’t need vendors at all. Basically all you need is an eBay account, and an Amazon purchasing account, and that’s it. Easy to get started, but you know you are going to get nasty letters from brand owners, you might get banned on eBay, you might get banned on Amazon. Personally I just don’t like people who do this business model, because you are not really adding any value at all. The other big downside of course is that you constantly have to be on the lookout for new products, and you have to watch the prices on Amazon like a hawk to make sure that you are still making a profit. Overall that business is great for cash flow, but I wouldn’t even really call that a business, it’s more like money making scheme that’s temporary. The next business model I want to talk about is called retail arbitrage or RA for short, and it has become increasingly popular over the last couple of years because of Amazon. If you recall I had Jessica Larrew on the podcast a while back. She makes 6 figures doing this, and she has been teaching other people how to do this as well, and here is how it works. Basically you walk into a liquidation store like a TJ Max or a Marshalls, and you go straight to the clearance section, and you will find that there is always going to be products that are cheaper than Amazon retail prices. So you basically go in, you buy the entire clearance section, and then you list those products on Amazon. The reason this model works is because a lot of consumers don’t have access to some of these stores, the only thing they have access to is Amazon, and so they are willing to pay higher prices. What’s really nice about this business model is that you don’t need a website, you can leverage Amazon’s huge market place for instant sales, there is practically no start up cost except for your initial inventory. But the major downside here is that your business is 100% at the mercy of Amazon, and you basically constantly need to go on these shopping trips to find new goods to list on the platform, which basically means that the amount of money you can make doing retail arbitrage is limited to the amount of time you can go shopping for bargains. I just want to take a moment to thank Bench Accounting for being a sponsor of the show. Now I love running e-commerce store, but you know what I hate doing the most? Book keeping, seriously keeping track of receipts, expenses, and especially inventory cost are easily the worst aspect of entrepreneurship hands down. And here is where Bench Accounting comes in. Bench is an online book keeping service that specializes in e-commerce businesses. They are experts at handling all e-commerce related reports, whether they be from Amazon, Shopify, Big Commerce, Stripe, you name it. All you got to do is sign up and they will pair you with a team of dedicated book keepers who will handle everything for you. So no more data entry, no more data crunching, no more headaches, plus it is reasonably priced, and the best part is you can get 20% off your 6 months if you go to bench.co/mywifequitherjob. 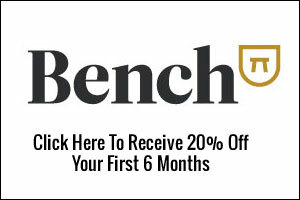 Once again that’s bench.co./mywifequitherjob to get 20% off your first 6 months, now back to the show. Recently Amazon actually started gating Lego products, and so you spend a couple of grand on this and guess what? Obviously you can’t sell this on Amazon anymore, and you are stuck with a couple of grand worth of legos that you can’t really get rid of because you can no longer sell those on Amazon. In fact all it takes is for Amazon to shut down a couple of brands that you have inventory of, and could shut your business down just like that. That’s why retail arbitrage is risky right now. Amazon is placing more focus on supporting brands which does not favor retail arbitrage. They’ve also introduced some large upfront cost to sell certain brands anywhere from $500 to $5000 from what I heard just for the privilege of selling a brand. And also recently they’ve started enforcing using GS1 bar codes that where your barcodes must actually match the brand that you are selling. All of those factors are making retail arbitrage really difficult right now, and so as a result, while this business is easy to do and it can be lucrative, it is pretty risky right now because Amazon can ban your brand. Next business model I want to talk about is drop shipping on Amazon, and drop shipping on Amazon against versus your own site, they are actually quite similar. The only difference is that you are drop shipping to people who’ve bought on Amazon instead, and the procedure is the same. You need to find drop ship vendors who are willing to ship products to the end customer on your behalf, and it’s important to note that this business model does not use FBA or fulfilled by Amazon. Basically you are responsible for filling the order to the end customer in a timely manner, and this business model is attractive because there is no start up cost, you don’t need a website. Because you are going with a drop ship vendor you can instantly have hundreds of products at your disposal that you can list on Amazon, but of course the problem with drop shipping is that everyone has access to the exact same products. The fact that it is so easy to list something on Amazon, there is probably a high probability that particular item that you are trying to drop ship on Amazon is already being listed on there. The other thing that’s extremely dangerous about this business model is that Amazon has really strict requirements on seller quality, and on time shipments. That’s why finding a reliable vendor is of the utmost of importance. So let’s say you have a huge sale, and you sell a whole bunch of products, but for some reason your distributor or your vendor has had an inventory glitch, and you can’t really fulfill the products to the end customers, and so what you end up doing is you have to cancel a whole bunch of orders on Amazon. Well guess what? Amazon is probably going to ban your account for doing that. Like I said Amazon is really strict on, on time shipments, and the fact that you don’t cancel orders that you’ve already taken in. If you guys are interested in this business model, in episode 108 of my podcast, my buddy John Rampton, he was doing drop shipping on Amazon, and he actually got banned for the exact same reason I just described. Basically he lost his 7 figure business overnight. So while this business model is very easy to get into, and it doesn’t have that much upfront cost to it, it is extremely risky, and it’s not really a sustainable business model. If you are thinking about doing this business model, go and listen to episode 108 first. All right the next business model is private labeling your own goods. Now private labeling is the act of placing your own brand or label on a product that you produce yourself. Basically the way it works is you first have to find a manufacturer to produce products for you in bulk, and basically they will allow you to put your own brand on the product. What a lot of people are doing right now is they are going to Ali Baba to find these manufacturers. Once you produce your product, you then ship off all of your goods to Amazon FBA, and you take advantage of Amazon’s huge market place to sell your goods. Because you are manufacturing, and you are buying your own products in bulk, you have to put more money upfront to actually get those products into Amazon’s warehouse first. So the typical minimum of investment I would say to do a private label product, the minimum, absolute minimum, is plan on the order of $500. Preferably you should have a 1000 or a couple of 1000 in order to purchase that initial inventory. In general what’s really nice about this business model is that you don’t need a website, you don’t need to generate your own traffic, because Amazon’s market place is getting you all the sales. There are no inventory requirements, because Amazon is housing all of your inventory, and the best part is that you are producing products with your own brand on it, so in theory there are no competitors. Now overall this business model is a little bit more challenging than the others, because it requires interaction with a vendor outside the country typically. You will have to likely deal with an Asian vendor where the cultures are different, but the big positive is that you own your own brand, you own your own products, and the margins are super high, greater than 66%. In fact for our store, for our private label products, our margins tend to be on the order of 75 all the way up to 95%. Because Amazon’s market place is so large, you can make a lot of money really quickly especially over the holidays when Amazon goes nuts. Now the downside of course of private labeling on Amazon is that you are dependent on Amazon. It’s been getting really competitive lately. If you have a successful listing on Amazon chances are you will get piggy backed or hijacked. What that basically means is you might have other sellers trying to sell on your listing something that is not the exact same product, and the upshot of this is if you end up selling a popular product, you basically have to monitor your products like a hawk. You also have to monitor your feedback for your products, because Amazon can ban you at anytime in the event that you get a string of negative feedback. The reason why this is really dangerous is because you are investing a large sum upfront for inventory, and so if you ever do get banned on Amazon for any reason, you could get stuck with a lot of unsellable products. Now I have been selling private labeling products on Amazon for a couple of years now, and the market place is pretty cut throat, and I’ve met and encountered a bunch of scumbag sellers. I’ve gotten tons of piggy backers. I had one dude over the holidays, he bought up all my inventory, so I had nothing to sell for that particular product over the holidays, and then once the holidays were over, he ended up returning all the merchandize, and so I didn’t get to keep the money for those products, and I lost out on the holiday sales as well. Stuff like this is going to happen, and it’s just a fact of doing business on Amazon. But you know overall selling private label products is actually the way I recommend, because you own the brand, you own the product, and you have the option of selling these private label products on your own website. It is by far the most sustainable way of making money on Amazon of any of the other models that I have presented so far. Next business model I want to talk about is closely related to selling private label products on Amazon, it’s selling wholesale products on Amazon using FBA. To sell wholesale products on Amazon, you first have to find distributors who offer a variety of products to sell, and basically you buy those products that you think are going to be profitable, and then you list them on Amazon. You send the on Amazon using FBA, and margins are typically on the order of 50%. Now similar of a private labeling, there is very few barriers to entry, you just need some product, then you just ship over to Amazon, and Amazon pretty much does the rest. You don’t really need a website. All you basically need to do is find wholesalers with large product catalogues. Once you sign up with a couple of vendors, you instantly have access to hundreds of products to sell at your disposal. The main difference between private labeling and selling wholesale is that when you sell wholesale, you don’t have to buy a large upfront quantity of goods like private labeling. When you are doing wholesale often times the minimum order for a particular product is on the order of $100. When you do wholesale, it’s really easy to just get a bunch of product, and just list them on Amazon, see which one sells, discard the ones that don’t sell, and then focus on the ones that do. But the main downside to selling wholesale on Amazon is that you are probably going to be selling the exact same product as someone else, and the thing about Amazon is that it’s really easy to list a product on there. And so if you are listing a product on there, chances are someone is also listing the exact same product as well, and when that happens the price tends to erode really quickly. This is actually something that happened to my buddy Lass. For about a year he was the only seller of this wholesale product on Amazon, but all of a sudden got discovered by someone else. Then it was only a matter of months, it happened so quickly, and he said all of a sudden he had all this inventory that he couldn’t make a profit on, and he ended up having to just liquidate everything for no profit. Selling wholesale on Amazon might sound attractive on the surface. In terms of long term potential, and sustainably, it’s not so great because you are selling other people’s products on Amazon, and chances are there is going to be others selling the exact same thing. Moving right along the next business model is selling wholesale products on your own website, and carrying inventory. Now 5 years ago this was pretty much the only business model around. It’s a pretty traditional model, you basically carry products, you hold inventory, and then you ship to people who buy from your website. Margins tend to be on the order of 50% when you do wholesale, and you need to handle your own inventory, which is a negative to a lot of people, but you can use a 3PL or a 3rd Party Logistics firm to handle the shipping and fulfillment for you, or you can even use Amazon FBA. Whenever an order comes in, you can go on Amazon’s interface and have Amazon ship a product to the end customer, and so that way you can list on Amazon as well on your own website pretty easily. Now what’s nice about doing wholesale on your own site once again is that the minimum order is a lot less than private label, often times on the order of 100 bucks. The main advantage of selling on your own website wholesale versus Amazon is that you are in control of your store brand; you are in control of what your shop looks like. You can probably do a better job with the sales process, putting content on there to convince people to buy, having an email sequence, and a funnel again to convert customers over. The downside of selling wholesale once again as with all wholesale business models is that you are selling the same products as other people, and whenever that happens the prices tend to erode pretty quickly. You really need to differentiate yourself based on content and the sales experience in your customer service in the event that you decide to sell wholesale on your own site. Now I saved the best business model for last which is basically selling private label products on your own website. It has the highest long term potential, because you are in charge of everything. You own the product because you are manufacturing your own products. You are driving traffic to your own store, you are in control of your own traffic, your own advertizing and everything. The downside of course is that you really need to know how to do all of these things on your site. You can’t rely on Amazon to drive traffic for you. You basically have to learn how to drive traffic yourself, and similar to selling private label on Amazon it does require some upfront capital as well to import some of these goods from overseas, but it does carry the greatest long term sustainability. You are in control, you can set pricing, you can define the product however you want, you can never get banned by anyone. So in the long run, and this is the business model that I really favor in case you want to start a long term sustainable business. If you are willing to put forth the work, selling your own branded products on your own site is easily the most secure way to run an e-commerce business. We have been in business since 2007, and things are still going strong, we have been growing in double and triple digits every single year. That’s just a high level overview of all the different e-commerce business models that I’ve seen around, and based on the webinars that I’ve been seeing on Facebook as well which I’ve watched. Those are the basic e-commerce business models that people are pushing right now. Now it’s important to note that there is nothing that excludes you from combining the different models, so for example just because I run my own site doesn’t mean that I can’t sell on Amazon as well. Just because I sell my own private label products does not mean that I can’t drop ship either, and just because I sell private label products on Amazon doesn’t mean that I can’t mix it up and sell wholesale products on Amazon as well. I suggest that you give all these business models a try to see which one fits your personality, but overall just keep in mind that selling private label products is the way to go in the long run if you want to create a sustainable business. It doesn’t matter whether you are selling on Amazon or your online store, owning your own brand and your products is the way to go. My philosophy is that if you are going to be spending the time and the effort to launch a business, you may as well chose a business model that is built to last, something that is sustainable in the long run. Now for our e-commerce, we sell private label products on Amazon, we sell private label products on our own store, and we also sell wholesale products on our own store as well. In the past, in the very beginning, we also dropped hipped a couple of items to fill out our store, because when we first launched we didn’t have a whole lot of products in our store. So in order to fill out some of the categories we had a couple of drop shipped items that we actually ended up not really selling that many, because we jacked up the price, but it was just there to make the store look fuller. One thing that you guys can do though if you are a little bit more risk averse is you can start out selling wholesale, and then find the wholesale goods that are selling the best, and then go and private label those products. Try to produce your own brand, make modifications to make those products better, and then just start selling under your own brand. The key thing to remember is that the more effort that you place on your business, the more defensible it’s going to be. If there is one take away that you take out of this episode is that you don’t want to be tempted into just starting a business just because it’s quick and easy and little risk, because chances are it’s not going to be sustainable. Now let’s just take retail arbitrage for example, Amazon is already changing the rules by preventing any arbitrage seller from selling certain brands. I know for a fact that Amazon is going to be starting brand central pretty soon, which will allow other private label sellers to prevent other people from piggy backing on their brands. And so when it comes down to just starting an e-commerce business, you really need just to be conscious of your cash flow needs, and decide whether you are going to be satisfied with doing something that’s a little bit more temporary in nature versus something built to last. One of the main reasons I like the private label route is because the barriers to entry are higher, because you got to source products, establish relationships with vendors in Asia. That’s one extra thing that a competitor has to do to copy your business idea, and that’s not even taking to account the relationships with the vendors that I have. Those are very valuable, and it’s very hard for someone to replicate a relationship, because it takes time to establish that. And of course because I manufacture a lot of my own products, and I control my own website, it’s much more difficult for someone else to carry the exact same products, or to copy my site. I’ve got years of SEO work in there, I’ve got years of content, I’ve got years of B to B customers that I have built up overtime, and it’s really hard to take that away. On the Amazon front as well, you know once brand central kicks in, it’s going to be hard for other people to sell my products as well. Amazon is less defensible than having your own website, but it’s really good to just launch your products on Amazon, pick the ones that are doing well, and then create your own website based on the products that are doing well on Amazon. Okay, and so hopefully that has provided you with a high level overview of all the business models. I really don’t recommend drop shipping on Amazon or selling wholesale on Amazon, or especially doing the Amazon eBay arbitrage in the long run, because those business models tend to be less defensible. Well I hope you enjoyed that solo episode, and going forward I might mix in more solo podcasts in with the interviews if the response is positive. For more information about this episode, go to mywifequitherjob.com/episode131. I also want to thank sitelock.com once again for sponsoring this episode. If you run your own hosted online store or any website for that matter that handles monetary transactions, you should probably give SiteLock a look. They can help you with your site, and your site speed issues as well, and did you know that e-commerce sites that take longer than 5 seconds to load often shed customers. Now SiteLock also has a service called TrueSpeed, which is a content delivery network that can increase download speeds by up to 50%. Go check out SiteLock today at sitelock.com/mywifequitherjob, once again that is sitelock.com/mywifequitherjob. Once again if you are interested in starting your own online business, head on over to mywifequitherjob.com, and sign up for my free 6 day mini course, where I show you how to start a profitable online store. Sign up right there on the front page, and I will send you the course via email immediately. Thanks for listening.